The first environmental case to be brought to the highest court of appeal of Belize: the 5 MW dam is a small project but brought about severe environmental damages in a "biogem" of Mesoamerica. Chalillo hydroelectric project was first proposed in the early 1990s and later integrated into the Central American Electric Interconnection System (Sistema de Integración Eléctrica para América Central - SIEPAC); it is operating since end 2005, built by the Canadian company Fortis with Chinese participation. The project was the subject of a huge campaign in the late 1990s and early 2000s by environmentalist groups in Belize and elsewhere who were concerned about the project's impacts on the Macal River. Since the first feasibility study there have been warnings of the heavy environmental damage, also due to the peculiarity of the Maya Mountains. 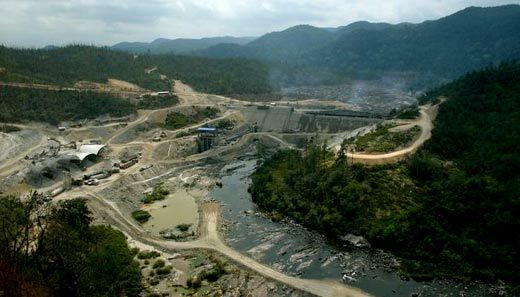 Only the head pond behind this dam will inundate 1,000 hectares of riverine habitat, which is, according to some scientists, the only habitat of its type in all of Central America. The dam would further threaten the endangered Scarlet Macaw and other rare species. The dam would fracture the Mesoamerican Wildlife Corridor, a rain forest tract stretching from Mexico to Panama, established to protect migration routes and breeding grounds for wild cats, migratory birds, and other animals. National Geographic News quote Sharon Matola, founder of the Belize Zoo and a principal of a lawsuit against the dam, the first environmental lawsuit of Belize, who said: "This is the cradle for biodiversity in Central America, and arguably the wildest place left in the region. Trading off millions of years of biological evolution for a hydro scheme which, at best, would last 50 years, is an environmental crime of the highest degree." There are also many unexcavated Mesoamerican ruins in the surrounding jungle. In 2009, local inhabitants and environmentalists published alarming pictures of dirty waters coming out of the dam; the water turbidity in the photos was the result of both organic and inorganic dissolved and suspended material in the reservoir . International Rivers quoted the geologist Jean Cormec, who observed that "the problem is really the geological make-up of the Maya Mountains, which are made of materials that during the normal tropical weathering process break down into very large amounts of clays, silt, sand and pebbles." BECOL tried to blame Guatemalan settlements and Xateros for the deforestation in the watershed for making the waters so turbid and threatening therefore drinking water supply for the country. Candy Gonzalez, president of the Belize Institute of Environmental Law and Policy (BELPO), said that many years after the dam was built, “we still can’t get information about water quality from the company or information on levels of mercury in the fish,” she said, noting that the river has been polluted with sediment. Cracks in the dam have been reported, putting over 16,000 people who live downstream at risk, but there is no emergency plan in case the dam breaks. Project Details The dam itself is 30 meters high (about 150 feet at it's highest point) and will produce a maximum of 5 Megawatts fixed energy, both from Chalillo and by adding storage to the Mollejon Hydroelectric Plant where the water will be stored and converted to energy. It is considered a run-of-river scheme. In the beginning construction of the project was estimated to cost US$30 million. Though Fortis/BECOL have never released the actual figures, the numbers recently presented at the November commissioning ceremony were in the neighborhood of US$100 million, over three times the initial estimates. Why? Explain briefly. The Canadian company is still making its profits and remains unpunished for the irregularities and corruption. Hershowitz, A. (2008). Solid Foundation: Belize's Chalillo Dam and Environmental Decisionmaking, A. Ecology LQ, 35, 73.